Sometimes it takes time to install pre-requisites especially for the SCOM web console. There you need IIS, .NET Framework 3.5.1 and tons of IIS modules. There is a way to simplify. Use Powershell . Now on the most right column you also see the name of the module you would have to add. 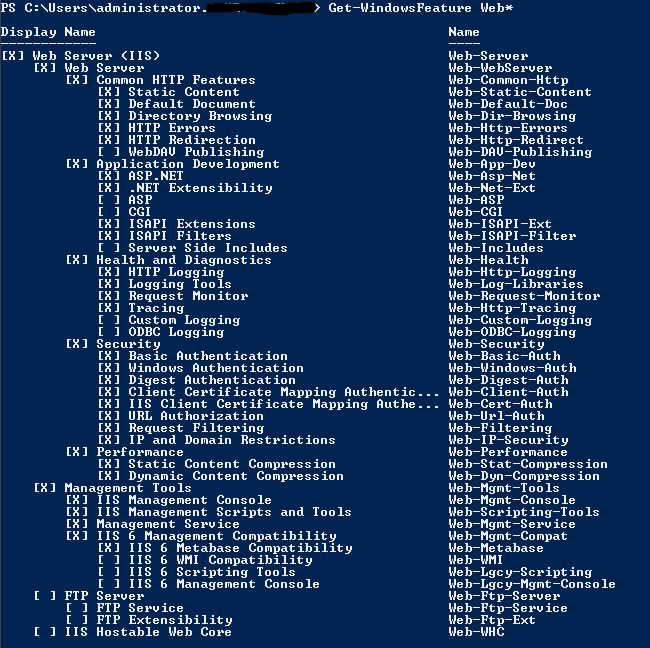 If you are a smart kind of guy then you dump all these lines into a Powershell file and you will never ever have to go and select every single IIS module in the setup wizard . Thanks! This is an awesome post. 1) It would be helpful to specify that you need to import the “ServerManager” module before you can even use “Get-WindowsFeature”. 2) This command would not work in PS console. Had to use regular CMD.exe console. 3) This command wouldn’t work in CMD.exe console. (probably the backticks). Does worksin PS console. Yes you are right. You Need to Import the Server Manager module first using Import-Module ServerManager. You could also call the cmd.exe within Powershell while calling the command. Weebly.com comment above is spam. I get that one repeatedly on my blog. Drives me crazy.